Will the Bolsheviks Seize State Power? Podemos, which means “We can,” is currently leading in opinion polls, ahead of both of Spain’s mainstream parties as the regional, municipal and national elections approach. The party was formed only a year ago, but shocked the political establishment when members won five seats in the European Parliament. Many in the crowd waved Greek and Republican flags and banners which read “the change is now, as demonstrators chanted “yes we can” and “tic tac, tic tac,” Reuters reports. “People are fed up with the political class,” Antonia Fernandez, a 69-year-old pensioner who came to the rally with her family told Reuters. Fernandez said she had lost faith in the Spanish Socialist Workers’ Party (PSOE) after its mishandling of the economic crisis and its harsh austerity policies. On Friday, Podemos said that 260 buses were to bring thousands of supporters from across Spain to the capital for the rally. Hundreds of locals had signed on to host the arrivals. 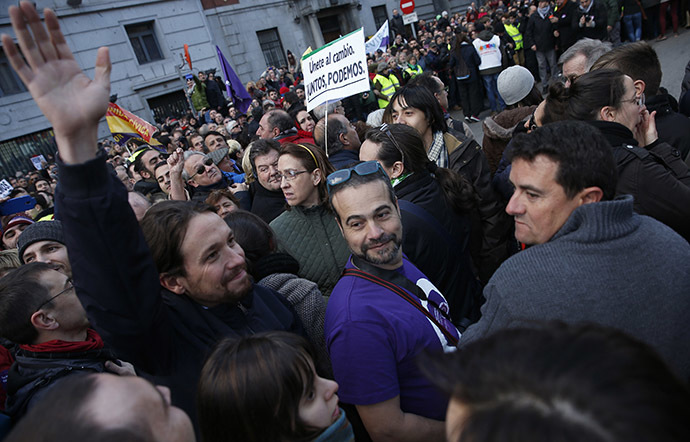 Spain has officially come out of its six-year recession, though unemployment remains at a staggering 23.7 percent. However, the Spanish economy appears to be on an upward trajectory, expanding at its fastest pace since 2007 in the fourth quarter. Gross domestic product jumped 0.7 percent from the last quarter, and 2 percent from the previous year. “If 2014 was the year of recovery, 2015 will be the year that the Spanish economy takes off,” Prime Minister Mariano Rajoy said last month. 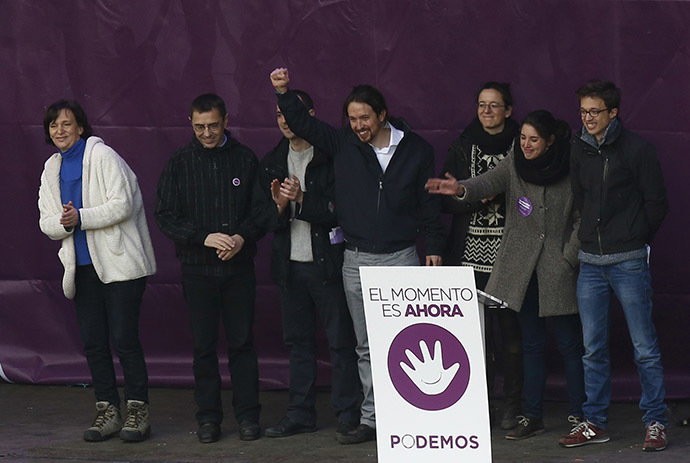 Podemos however is banking on the support of a population ravaged from years of austerity and hope to ride the coattails of left-wing Syriza’s recent sweeping victory in Greece. And many in Spain have not seen the signs of these improvements. 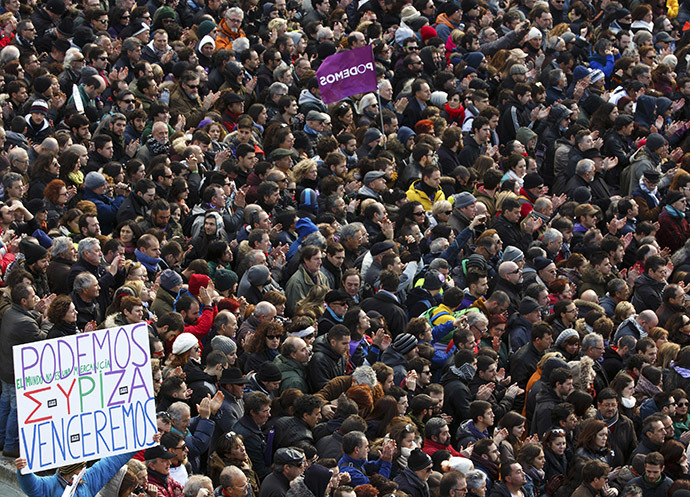 Disillusion with the predominantly two-party system and tangible economic woes have created a political and social landscape for anti-establishment Podemos to thrive. In the first six months of 2014 courts approved more than 21,000 home evictions, as the summer of low-paid and short-term contracts has soared. Meanwhile, several high profile corruption scandals have tainted the reputations of many of those in power. In October, dozens of public officials and bureaucrats were arrested throughout Spain in a massive graft investigation. Some of those implicated were high-ranking members of Rajoy’s ruling People’s Party.